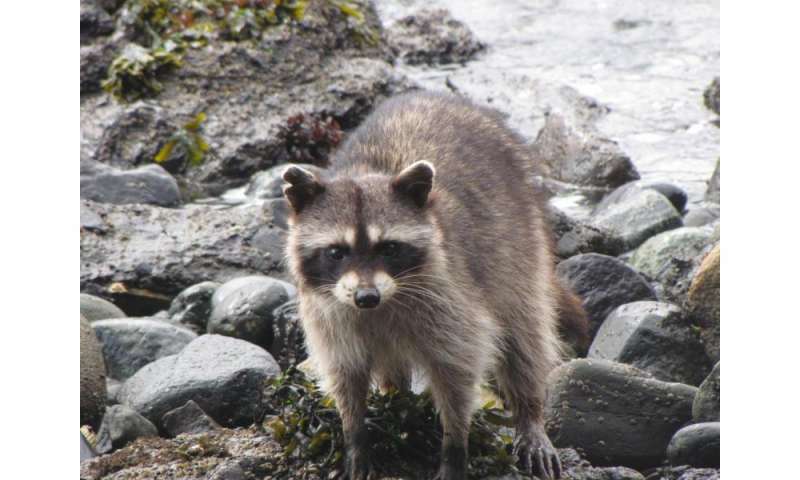 'Fearless' raccoon foraging on the shoreline in the Gulf Islands, British Columbia, where native large carnivores have been extirpated. Credit: Marek C. Allen. Lions, wolves and other large carnivores are frightening beasts that strike fear into humans and other animals. A new study led by Western University demonstrates that the fear these top predators inspire can have cascading effects down the food chain critical to maintaining healthy ecosystems, making large carnivore conservation all the more valuable given the significant 'ecosystem service' the fear of them provides. These findings from Western's Liana Zanette and PhD student Justin Suraci, in collaboration with Simon Fraser University's Lawrence Dill and the Raincoast Conservation Foundation, were published today in Nature Communications. Zanette, a biology professor in Western's Faculty of Science, Suraci, and their colleagues, experimentally demonstrated for the first time that the fear of large carnivores is itself powerful enough to have effects all the way down the food chain and restoring this fear can reverse the adverse impacts resulting from the ever-increasing global loss of large carnivores. "These results have critically important implications for conservation, wildlife management and public policy," explains Zanette, a renowned wildlife ecologist. "We have now experimentally verified that, by instilling fear, the very existence of large carnivores on the landscape - in and of itself - provides an essential 'ecosystem service,' and failing to consider fear risks dramatically underestimates the role large carnivores play in structuring ecosystems." Racoon hears playback of dogs. Credit: Justin Suraci. Humans fear large carnivores because they pose real and perceived threats to human life and livelihoods, which is why conservation actions, like the reintroduction of wolves to Yellowstone National Park, are so controversial. Proponents argue that the presence of large carnivores creates a 'landscape of fear' necessary to keep their prey, like deer, coyotes and raccoons, from eating everything in sight, but opponents counter that the evidence for this is weak. This ground-breaking study definitively resolves this debate. Raccoons on British Columbia's Gulf Islands are devastating songbirds on land and intertidal crabs and fish in the ocean. The researchers suspected this is largely due to the raccoons having little to fear, since most of the large carnivores that prey on raccoons (ie. cougars and wolves) were eliminated a century ago. To experimentally manipulate fear, the team played the threatening sounds of large carnivores (or non-threatening sounds) from speakers along extensive lengths of shoreline for months at a time. The fear inspired by simply hearing large carnivore sounds dramatically reduced the time raccoons spent feeding and reversed their impacts on their prey. This had cascading effects all through the ecosystem.